In the formative years of cocktailing, the early to mid-1800s, most drinks were just a shot of liquor with a little water, a little sugar, and a splash of bitters. In fact, this was also sometimes referred to as a bittered sling, the sling being a drink of liquor, water, and sugar that predates the term “cocktail”. As liqueurs became more widely available in the latter half of the nineteenth century, “improved” versions of cocktails began to feature additional liqueurs, citrus zests, and other flavors. The Improved Whiskey Cocktail, one of the most venerable, still survives on bar menus today. This is a great “step up” from an Old Fashioned. 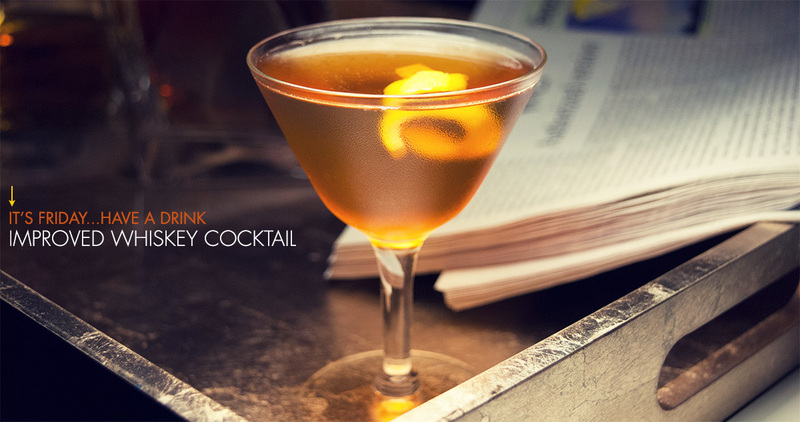 I use the quotes because there is absolutely nothing wrong with the Old Fashioned — it’s perfect — so the only way in which you’re really stepping up is toward a cocktail with a little more complexity. There’s just more going on here, from the earthy maraschino to the aniseed pastis rinse. It’s really excellent. I like to use a LOT of bitters in this. Six dashes or so. I’ve left the recipe at two because that’s more traditional, but I recommend giving my way a shot. The cap with the hole in it on bitters bottles like Angostura is called a dasher cap, and I generally consider two shakes of the bottle to be a “dash”. Yes, I’d say 1/8th tsp is about right for the pastis, but it’s fine to just eyeball it … enough to coat the glass, without having too much that you have to throw away.